HOW-TO Blow-dry with a paddle brush, not a round one, to avoid a wave-like effect on hair and bangs. Finish with an anti-frizz spray to ensure a smooth look. BUY ONLINE NOW Spornette Small Paddle Brush, $6; shop.com. HOW-TO Spritz volumizing spray on wet hair, then start by blow-drying the bangs, holding them taut and pointing the nozzle of the dryer down. Then, dry the rest of the hair with a round brush, "lifting hair away from scalp to create volume," says stylist Nelson Chan. When dry, wrap sections of hair around a 1.5-inch curling iron. Pull the hair behind the bangs back into a small ponytail and secure with a clip or bobby pin. INSIDER TRICK "Alternate curling sections forward and backward with the iron to get more natural looking and evenly-separated curls," says Chan. BUY ONLINE NOW Titanium Ionic Curling Iron, Barbar, $145; barbarhairtools.com. 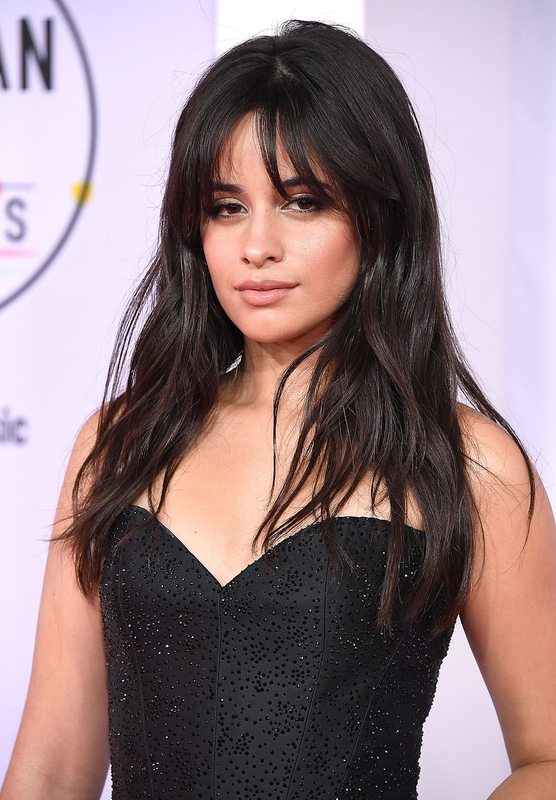 INSIDER TRICK Selena’s bangs hit at the eye-“When requesting this cut, point with your finger where you would the bangs to rest when dry,” says Garcia. Try on Selena's hair now! HOW-TO Use a flat paddle brush while blow-drying hair. If you have any flyaways, smooth over the hair with a flat iron on a low-heat setting. INSIDER TRICK “To get this sleek, long look, the hair can’t be too thick,” says stylist Jim Wayne. BUY ONLINE NOW Remington flat iron, $29; at folica.com. Try on Jada's hair now! HOW-TO Ask your stylist for a bob that’s even in length around the entire head, says stylist Jonathan Garcia of Las Vegas’s Ritual Salon amp Spa. “Communicate that you want a square chin-length bob with a full bang that goes to the brow when dry. 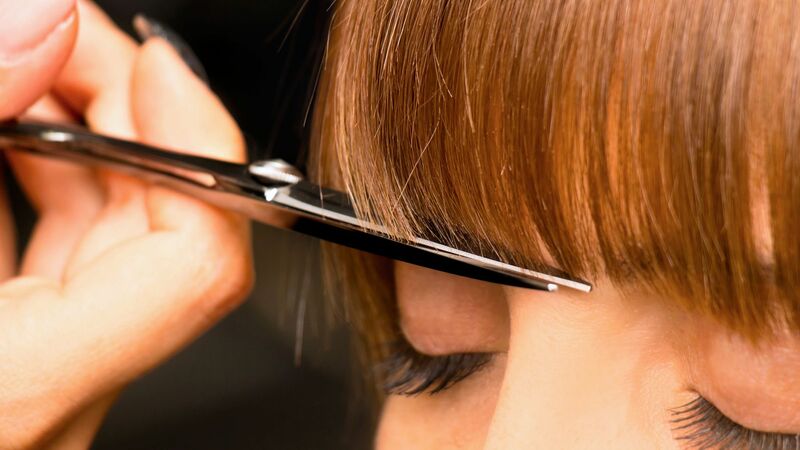 Do not cut the bangs when wet, as they will shrink when dried and may be shorter than you would like. Also, ask that the stylist to use a razor on the ends to frame the face and add a bit of edginess,” says Garcia. INSIDER TRICK Says Garcia, “Stay away from silicone-based polishes because you want a more dry look,” as opposed to something too greasy. Try on Mena's hair now! HOW-TO Klum's stylist Helena Faccenda recommends blow-drying hair with a round brush until almost done and then finish with a flat Mason Pearson brush. She recommends smoothing the look with a HAI ceramic flat iron. INSIDER TRICK "Never put the blow dryer and brush underneath the bangs," says Faccenda. "Blow them straight down or you'll wind up creating a round bang." Try on Heidi's hair now! INSIDER TRICK Style the bangs while blow-drying by blowing down on them; and don’t use the curling iron them. BUY ONLINE NOW FHI ceramic curling iron, $195; folica.com. HOW-TO “After you wash and thoroughly rinse the hair, gently towel-dry it to remove excess water, warm a small amount of hair polish in the palms of your hands and apply,” says styliyst David Babaii. Blow-dry using a large round brush. “It doesn’t need to be perfectly straight at this point,” says Babaii, who says to finish by flat ironing the hair (and bangs) and applying another light coat of polish. INSIDER TRICK “Warming the polish in your palms boosts its ability to seal the cuticle, while repairing and strengthening each strand-and adds mega-shine,” says Babaii. BUY ONLINE NOW David Babaii for Wild Aid Hair Polish, $15; db4wildaid.com. Try on Camilla's hair now! HOW-TO Let hair air dry, suggests stylist Neil Weisberg of L.A.'s Neil George salon. “Then wrap hair around a one-inch curling iron to achieve the curls. 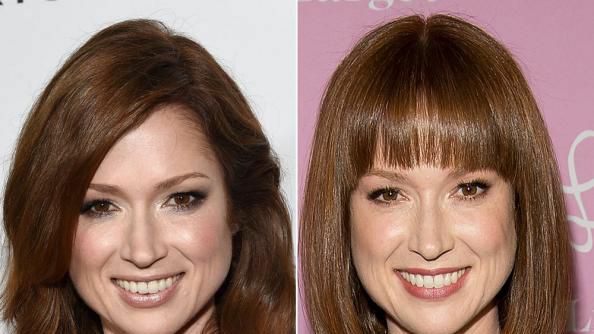 To get bangs like this, ask for a cut where they are “razored out a little,” says Weisberg. INSIDER TRICK “Leave ends out of the curling iron and mostly just wrap the middle section of the hair to produce these soft, natural curls,” says Weisberg. HOW-TO When blow-drying the bangs, pull them straight between your second and third fingers and then slightly to the side as you near the ends and set with a light hairspray. "To style, part hair to the side and then pull hair into a loose bun," says stylist Laurent D. "Allow a few pieces of hair to fall to the forehead and finish with a texture spray and shine serum." INSIDER TRICK Bangs will do this bend more easily if hair is naturally wavy. BUY ONLINE NOW Texture spray, mop, $16; ulta.com. HOW-TO This is a great style for someone growing her bangs out. "Blow dry roughly until hair is 50 percent dry," says stylist Jamie Bakos. Use a round Mason Pearson brush to give volume to the roots and bend hair slightly under at the tips. Finish with a flat iron on the ends for a smooth look. INSIDER TRICK Blow dry bangs to the opposite side you will be wearing them. BUY ONLINE NOW Mason Pearson Pure Bristle brush; $170; drugstore.com. Try on Charlize's hair now! HOW-TO Start by combing a serum through damp hair, says stylist Edward Tricomi. Then blow-dry using a Mason Pearson brush, pulling pieces down for a less voluminous look. Finish with a shine product. INSIDER TRICK "Using a paddle brash will help evenly distribute shine, without dulling the hair down when blow-drying it," says Tricomi. BUY ONLINE NOW Shine Pomade, Davines, $28; drugstore.com. HOW-TO Ask your stylist to start high on the head with a radial part, so the bangs will fall straight down from the top of the head. INSIDER TRICK Long, thick bangs make the face look wider, so round faces should avoid this style. Try on Joy's hair now! HOW-TO Ask your stylist for a wide bang that will flatter your features. "Katie's bangs have been cut wide enough on either side of her face so as not to cover her strong features," says Burton Machen, stylist and co-owner of Salon Maxime in Beverly Hills. "Smooth texture is key to achieve this style," he adds. For a sleekness like Katie's, try an ionic ceramic flat iron, which cause less damage to hair than other irons. INSIDER TRICK "This style looks best on people with round face shapes because it can draw away from the roundness," says Machen. BUY ONLINE NOW Ceramic Styling Iron, FHI, $105; blissworld.com. Try on Katie's hair now! HOW-TO Use a dime-size amount of balm or cream shine product through the hair, and to smooth the bangs slightly to the side. Blow-dry bangs and the rest of the hair with a paddle brush-a round brush will give too much of a voluminous look. INSIDER TRICK Stylist Marco Maranghello says, "If you have thick hair use a cream shining product and if you have thin hair like Reese's, use a balm. A cream-based product for shine is too heavy on thin hair." BUY ONLINE NOW PhytoSpecific Moisturizing Styling Balm, $24; aveyou.com. Try on Reese's hair now! 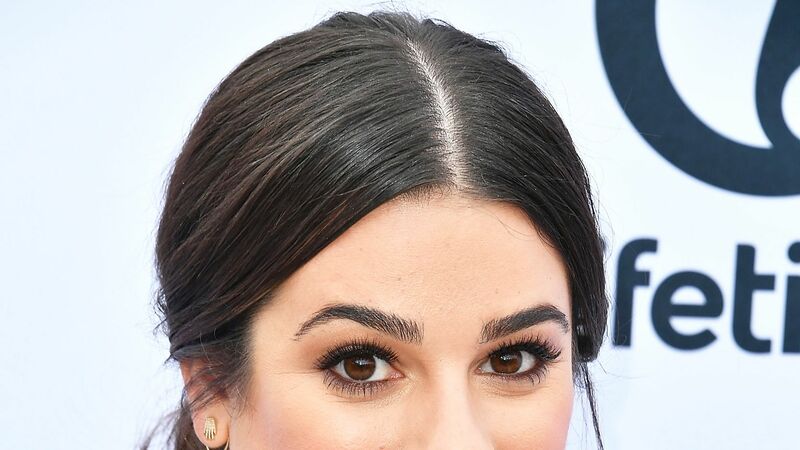 HOW-TO This bang is cut to follow the contour of the eyebrow. 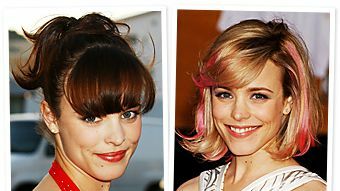 "To keep the bang from looking too heavy, pull sections up from just in front of each ear," says stylist Burton Machen. Brush everything else back and use this section parallel to the ears (across the top of the head) to incorporate into the bang. INSIDER TRICK To get the soft movement in this style, avoid using a flat iron. "If you're addicted to your flat iron, however, use a heat-activated conditioner like Kerastase Thermique Ciment," says Machen. "It uses the heat for a positive purpose and it smells great." BUY ONLINE NOW Ciment Thermique, Kerastase, $34; fredsegalbeauty.com. HOW-TO Blow-dry the bangs first, "holding the dryer above your hair so the hair lays flat on the forehead," says stylist Mario Russo. Then use a round brush to straighten hair while drying, slightly rounding out at the ends. INSIDER TRICK Avoid a round brush on the bangs. "It will create a big puffy bang," says Russo. "Instead try a vent brush or comb." BUY ONLINE NOW Hyflex vent hairbrush, Denman, $9; cosmeticsolutions.com. 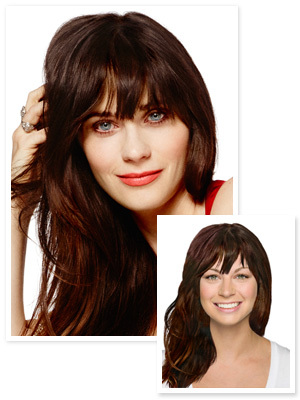 Try on Zooey's hair now! HOW-TO Have the stylist cut the bangs at eye level-because when hair dries, it bounces up a bit shorter. Blow-dry straight with a paddle brush after applying a straightening balm. INSIDER TRICK Bangs look softer if they're cut with a razor. Try on Mischa's hair now! HOW-TO Apply a light styling glaze and Kerastase Volumactive to hair and massage into roots. Blow-dry hair halfway. Section off hair and finish blow-drying with a flat brush. Mist with Ellnet hairspray. INSIDER TRICK The best way to make this look work is to invest in a great cut, says stylist Patrick Melville. BUY ONLINE NOW Kerastase Volumactive Expansion Spray, $34; www.fredsegalbeauty.com. HOW-TO Apply a relaxing gel to wet hair. Using a large nylon-bristled brush, pull two-inch sections of hair taut and blow-dry aiming the nozzle down in order to get the hair straight. "Use a small round brush to smooth out ends and give a little flip to the bangs without making them poufy," says stylist Joaquin Hortal of N.Y.C. 's NAO salon. INSIDER TRICK "Nylon brushes are best for managing super thick hair," says Hortal. BUY ONLINE NOW Spornette Provo Tourmaline Round Brush Series, $14; www.folica.com. HOW-TO Let hair air-dry 75 percent, then finish drying with a small round brush. Dry bangs using the brush, slightly twisting the brush as you pull through the bang to give it a face-framing shape. Finish with a light hairspray to keep in place. INSIDER TRICK Blunt bangs make the face look wider. You can part bangs like Mandy's to reveal more forehead area. BUY ONLINE NOW Sebastian Shaper Spray Regular, $15.99; salonsavings.com. Try on Mandy's hair now! HOW-TO Stefani wore a wig here, but to get the real deal have bangs cut just below the eyebrows and straight across to the temple. On wet hair, spritz on a volumizing spray. After it's dry, rub a no-frizz serum between palms and smooth over hair. INSIDER TRICK To get bangs stick straight, stylist River Lloyd says to pull bangs taut between your second and third fingers and then use a small flat iron. HOW-TO Have your hairdresser cut bangs from the top of the head, with a radial part, where hair falls from the top of the head evenly. Use shampoo, conditioner and styling cream designed to aid in straightening, and finish with a shine spray. INSIDER TRICK These bangs are very heavy and look best on women with no natural wave. BUY ONLINE NOW Philip B Shin Shine, $26; philipb.com. Try on Naomi's hair now! HOW-TO After washing, blow-dry bangs with a flat brush, or pull them taut between the second and third fingers. A light styling spray will keep them in place. Let the rest of the hair air dry. INSIDER TRICK A side part makes a big nose look smaller, according to stylist Eva Scrivo. BUY ONLINE NOW Kenra Light Hold Styling Spray, $14.00; cosmeticmall.com. HOW-TO After washing, add a volumizing spray, then blow-dry with a flat brush. Smooth over the bottom half of the the hair with a flat iron, which will maintain the root volume, but straighten the ends. INSIDER TRICK Bangs like Jennifer's should be cut so they meld into the layers and there are no sharp angles, creating a soft look. BUY ONLINE NOW Buy Online Now: Redken Workforce 09 Flexible Volumizing Spray, $12.95; beauty-mart.com. 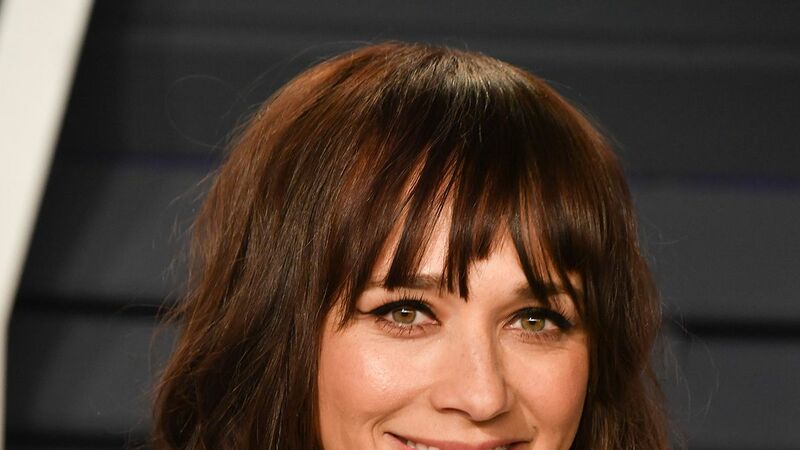 HOW-TO Bangs instantly add youth. Sandra Bullock's bangs are cut straight across the face and then slightly turn down as they blend into the rest of her hair. INSIDER TRICK Stylist Jonathan Antin says that you don't want a greasy product in the bangs that will weigh them down. BUY ONLINE NOW Buy Online Now: Jonathan Dirt Texturizing Paste, $26; sephora.com. Try on Sandra's hair now! HOW-TO After washing, comb bangs from the top of the head and pull back the rest of the hair into a clip. Pull bangs taut between second and third fingers and blow-dry down. Unclip rest of hair and blow-dry, curl with an iron and style with a curl-defining pomade. INSIDER TRICK Easily change up this style by switching to a side-part and pulling the bangs to the side. BUY ONLINE NOW Carol's Daughter Kizzi, $9.50; sephora.com. HOW-TO Blow dry hair straight. Use a flat iron to get the bangs stick-straight. Curl the rest of the hair with a 1½-inch barrel iron. INSIDER TRICK "If you have a round face, then get a shorter bang," says stylist River Lloyd. "It will look like you have a longer forehead," which lengthens the face. BUY ONLINE NOW Buy Online Now: Elchim Hair Dryer, $99.25; beautysak.com. HOW-TO A square face mandates that bangs be cut with soft angles to balance out the shape. Style with a medium-round brush to define layers and finish with a flat iron on any unruly pieces. Tame ends with a serum rubbed lightly between the palms and smoothed over. BUY ONLINE NOW Buy Online Now: Kerastase Serum Nutri-Sculpt, $41; diamondbeauty.com. INSIDER TRICK By pulling the hair up like Keira's, the face isn't overwhelmed by too much hair. HOW-TO Long sideswept bangs are flattering on all face shapes and work well on thin hair like Ashley's. They should be cut at an angle that swoops down to the bottom of the ear lobe. To style, use a flat iron with flexible plates and gently pull bangs to the side toward the ear and twist the wrist to curl down. INSIDER TRICK Long bangs like these are easy to pull back if you're an active person who doesn't want hair in her face. BUY ONLINE NOW HAI Stik Ceramic Flat Iron, $69.95; folica.com. Try on Ashley's hair now! HOW-TO Says stylist Eva Scrivo: "Blow-dry the bang before the rest of your hair so it doesn't have a chance to have a mind of its own." Use a flat brush and pull bangs toward the ear while pointing the dryer down over the hair. INSIDER TRICK Have your hairstylist cut the bangs starting at the side part, just above the eyebrow, down in a swooping shape that reaches the lower part of the ear. BUY ONLINE NOW Mason Pearson Pocket Size Brush, $57.50; blissworld.com. Try on Nicole's hair now! 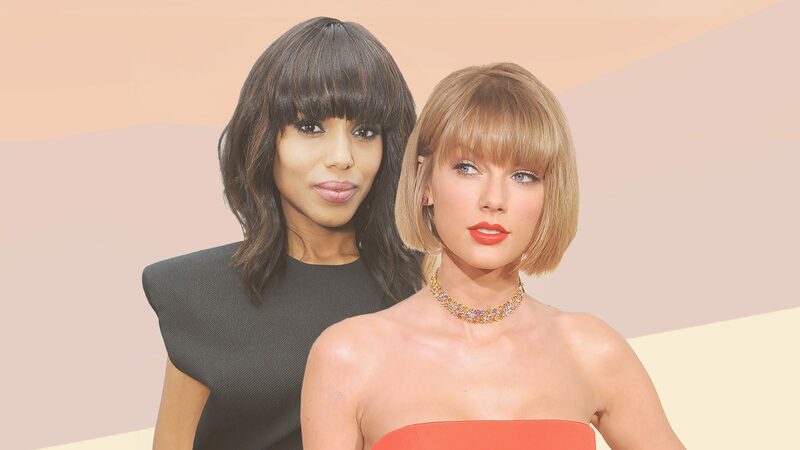 Should You Ask Your Stylist to Razor Your Bangs? New Hairstyles 2012: Chanel Iman's Bangs! 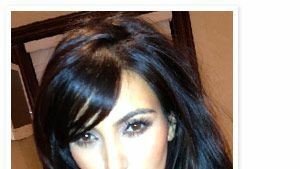 Kim Kardashian Debuts Bangs -- Again!